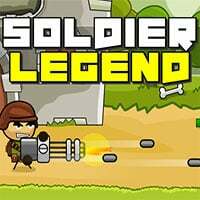 Soldier Legend is a action defense game where you defend your castle from invaders. Face-off against aliens, monsters and mighty opponents but more. This game is the greatest action game, is combination of fighting games and shooting games. Like other fighting games, you will be brought to the awesome adventure world. You have an opportunity to show off your shooting skill as to be in shooting games. Gun down wave after wave of alien monsters in this action packed shooter game. Collect coins to purchase new guns, towers and power ups. Use your best strategy to defeat each wave of oncoming invaders. As you attempt to complete all 30 action packed levels. Place towers at the best time to help assistant in your mission of taking out the aliens before they take you out. So enjoy and have fun in playing Soldier Legend Game.